Ada's modern concierge process is the cornerstone of our business, and the way we guarantee our clients are delighted and satisfied with each piece of jewelry we deliver. Read on to learn more about what to expect during the creation of your bespoke fine jewelry. Whether you'd like to iterate off of one of our collection pieces, or pick a lab grown loose diamond, your journey begins with an Ada Diamond Concierge. At Ada, we treat our clients as just that; not customers, not anonymous purchasers, but as clients for whom we create beautiful pieces of bespoke, conflict-free fine jewelry. Our services go beyond merely selling you a stone. We provide a simplified, one-stop shopping experience combining the client-level service of a private jeweler with the ease, transparency, and 21st century technology of an online retailer. At Ada, we take great pride and joy in delivering beautiful fine jewelry without compromise. Each piece of Ada jewelry is fully bespoke, and made just for you. What is "bespoke"? Bespoke means you get exactly what you want. Bespoke is custom, made to order, made for you. It means having a one-of-a-kind piece of fine jewelry and having a say in how your fine jewelry will look and feel. If you've spent any time searching the internet for diamond jewelry before landing at Ada, we know you might be feeling a bit overwhelmed. Much of a custom jewelry process can be time-consuming and complicated, and we protect our clients from having their time wasted. Other big internet retailers will let you sift through thousands of stones then add to a non-customizable, cookie-cutter setting. There's a reason the settings all look the same from site to site; that's because they are! Here at Ada, each one of our clients is special; and special people deserve a custom piece. Our Concierge Team makes the process simple for you by carefully curating the perfect stones for you from thousands of lab grown diamonds in our inventory. We have access to every lab grown diamond in the world and will sell you only the best of the best, every time. The first step in the process is your initial consultation with your Ada Concierge over email, phone, or video chat. Your Concierge will begin taking careful notes about your vision for your jewelry, your timeline, and your budget. Consider our collection pieces as your source for inspiration, rather than a rigid limitation of styles. All of our bespoke fine jewelry is fully customizable to meet our clients specifications. That means that 100% of our bridal pieces are custom, every time. Everything from simple solitaire settings to intricate melee pieces are modified for our clients utilizing computer-aided design software and 3D printing technology. We know that just because a stone is set in a solitaire doesn't mean it's not special. At Ada, it's never OK to use a mass-produced setting from a big box wholesaler. Your Concierge will curate a list of 4-6 stones that best fit within your specifications for size and quality. We thoroughly examine each grading certificate and will happily explain our rationale for the stones we've chosen to show you. Most of our clients narrow down their search to 1-2 stones based on price and availability. Ada does not work with diamonds beneath these quality levels. 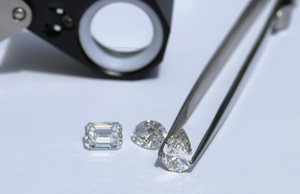 Videos are a significant part of the diamond selection process. In addition to high definition videos in our state-of-the-art lightbox, we also send realistic iPhone videos showing your diamonds in multiple daily settings and lighting. This allows you to see what your diamond will truly look like in real-life environments. You might actually find yourself surprised by the amount of media you receive from your Concierge! We know that making a purchase like a diamond online can be a bit intimidating and we understand you want to get as close as possible to seeing the diamond in person before making such a big decision. We will keep sending videos or photos until you're fully confident in your choice. For those local to the SF bay area, many of our clients will choose to select the stone in person after going through our initial virtual Concierge experience. In order to reserve a stone for the custom design process (or longer than 72 hours), your Concierge will request a non-refundable deposit to proceed. This deposit is designed to show your seriousness in moving forward with the design process. Ada's bespoke design process is as immersive and involved as our clients would like to be. Transparency is our goal! We often say that if you are surprised when you receive your piece, then we have failed as Concierges! Most of our clients will make 1-2 changes to a design after seeing initial renderings; however others are intimately involved, providing direction through several iterations. Both levels of involvement are welcome and encouraged! After your initial consultation, your Concierge will work side-by-side with one of our five in-house designs to create your bespoke piece in CAD 3D modeling software. You will receive screen shots from that CAD and rough renderings of your piece throughout the design process. These initial renderings are easily and quickly exported out of 3D printing software and may show extended prongs, gaps, or heavy metal. Once these pieces go into fabrication, the prongs are bent, the diamonds set, and the metal polished by hand. Depending on the complexity of your piece, Ada designers may conduct a sketch prior to CAD. After the design has been finalized, you'll receive a photorealistic rendering (like those found on our web site) to show the proper height of the stone, the size and shape of side stones, prong styles, etc. These renderings take several hours or even days to produce, so they are sent at the very end of the design process. If you like, we can send videos of a 3D printed wax model of your design prior to your piece going into casting and setting. Once your piece goes into fabrication, you'll receive regular updates and communications as to the status of your piece. All of Ada's jewelry is cast and hand set in the United States. Most of our pieces take only 2-3 weeks after the design has been finalized, with simple pieces available in 1-2 weeks. After your piece is finished, you'll receive high definition videos and photos, which you are free to share on social media. These pictures are also included in your Appraisal and Statement of Replacement Value which you can use to get your piece of fine jewelry insured. The full remaining amount of your invoice is due prior to shipping. Your Concierge will then package your jewelry in our signature jewelry boxes. For surprises and proposals, you may have the choice of a smaller box for easy concealing or a larger box to display multiple designs. Your piece of fine jewelry is sent via Fedex fully insured and complimentary anywhere in the USA (for high-value pieces, an armored carrier such as Brinks may be required). We ship to select countries via Fedex Two-Day International Shipping for $35. If the jewelry is a surprise, Ada will gladly work with you to ship your gift to a work address, or have the package held at a local Fedex location for you to pick up at your convenience. Now it’s time to enjoy your new work of art! Your happiness and satisfaction is our end goal. Client referrals, repeat purchases, and brand evangelism are all a significant part of our growth as a small business. We're not satisfied until you're fully satisfied. Trust, honesty, and integrity are core values and how our Concierge team treats our clients. By the time you're finished with the Ada Diamonds process, you should feel like your interests were heard, recognized, and honored. For a Diamond Concierge, the best part of the process is your reaction to your new jewelry! We love reading your emails, reviews, and seeing our client's photos of their new jewelry on Facebook and Instagram! Don't forget to tag us! Are you ready to schedule your consultation? Our team is waiting to build you something beautiful.